Made by Bike Technologies in Bundoora, Victoria, Australia, 1997. In 1996 production began in Australia on a bicycle which has taken the bike racing fraternity by storm. Nicknamed the ‘Superbike’, it features a special lightweight carbon fibre frame designed by a collaborative project team from the Royal Melbourne Institute of Technology (RMIT) and the Australian Institute of Sport (AIS). It is an excellent example of the application of scientific research and aerodynamic design to sport. The Superbike bicycle comprises a special frame designed and made in Australia. The remaining components, disc wheels, cranks, pedals, seat, chain, etc, were made by Campagnolo, of Vicenza, Italy; this company is a sponsor of the Olympic cycling team. The mass of the bike is 5 kg. The conventional tubular frame has been replaced by a composite monocoque shell made of carbon fibre which is scientifically shaped to reduce aerodynamic drag. The conventional handle bars have been eliminated, and instead carbon fibre handlegrips are attached directly to the wheelforks. This feature provides extra strength between the seat and pedals, where the rider's power is exerted. The sweeping aerodynamic lines of the Superbike combine with the lightweight carbon fibre shell to enable the bike to travel at a given speed with the exertion of five percent less power when compared to a conventional tubular framed racing bike. The use of the carbon fibre construction enables any shape to be formed with maximum strength and minimum amount of material. This is why carbon fibre is used so widely in the space programmes and Formula One motor racing. Unlike most equipment used by elite athletes, the Superbike has been designed for low cost, high volume manufacture. The Superbike was designed and built by a project team from the Royal Melbourne Institute of Technology (RMIT) and the Australian Institute of Sport (AIS) headed by Mr Lachlan Thompson, an aerospace engineer and lecturer at RMIT. 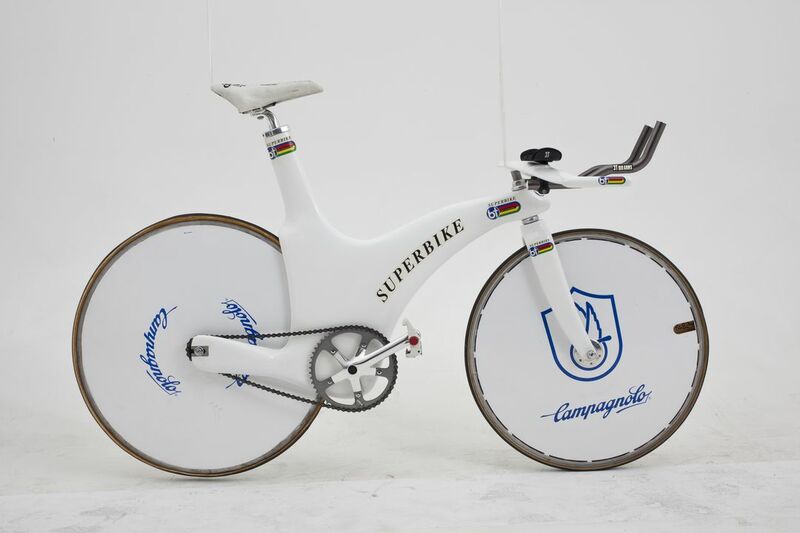 The whole project started by accident in 1992 (before the Barcelona Olympics), when Thompson, who specialises in aerodynamics, was setting up a photo session to contrast the modernity of a jet fighter to the antique technology of a bicycle. The cycling model failed to arrive, so Thompson went into Swanston Street, Melbourne and spotted a young cyclist, Kathy Watt. In return Thompson offered to put Watt in the RMIT wind tunnel to check the aerodynamics of her bike and riding position. When biomechanist Dr Brian McLean at the AIS heard about this he wanted all the other AIS cyclists checked in preparation for Barcelona. While working in the wind tunnel, Thompson revealed he had already done some preliminary work on bicycle design which had been shelved. One thing led to another and a project team was formed and the Superbike developed in consultation with Olympic cycling team coach, Charlie Walsh. The research team included scientists, engineers, technicians and students. Most of the hard work was put in by engineering students Vaughan Bolwell and Rodney Peck, who both worked tirelessly during the critical stages of the bike's development. The choice of using carbon fibre technology, an area where RMIT had special expertise, was an obvious one. Thompson was determined from the outset that the product his team created had to be suitable for mass manufacturing, but at the same time it had to have the quality and precision of a jet fighter. The Superbike is made in Australia by Bike Technologies headed by Mr Salvatore (Sal) Sansonetti. Once the bike had been designed the project leader, Lachlan Thompson, was determined to put it into production in Australia. The problem was that bicycles had not been made in Australia since 1990 and from then had been imported from Japan, Taiwan, China and the U.S.A.
Thompson was introduced to Sal Sansonetti, who wanted to make bicycles, by a friend Thompson had worked with at Aerospace Technologies before he joined RMIT. Sansonetti was a former Olympic cyclist who rode in the Australian team at Montreal in 1976. He was also the Italian Champion in 1970 and won two stages of the 1971 Tour of Italy and the Milan Six. Not only did Sansonetti understand bikes and metal, but he was also the owner of a company, Nezkot, which made injection moulding dies for clients such as Holden and Ford. This technology was not too different from the manufacture of carbon fibre, one-piece bicycle frames. A new company was formed in 1996, Bike Technologies, not only to provide bikes for the AIS but to manufacture the Superbike in track, touring and mountain bike types for world distribution. Networks are currently being established overseas. Bikes have already been sold in England, USA, South Korea, South Africa and New Zealand. A percentage of the turnover from Bike Technologies is earmarked for research and development.